I am so excited to be involved in this! Come see us on May 4 and 5! Edited by Fletch, Wed Mar 20, 2019 6:46 PM. Is that Scott Baio in the picture? Lorraine? As in the wire-wrap Amiga proto that supposedly took up a few cubic feet hidden under a desk? And yeah, my thought of the pic was Joanie and Chachi though by that time she would have been about 20 and they look younger than that. That is not Erin Moran but I think it is definitely Scott Baio. I am really looking forward to this. I haven't seen Curt in about 15 years and some Atari-specific computer presentations sound fantastic. My biggest problem is that I don't think that I will be able to make it to the show for both Saturday and Sunday; I will have to pick either one or the other. Edited by SS, Thu Mar 21, 2019 9:12 AM. Saturday's are definitely more heavily attended, so it has more of an event feel to it. Joe Decuir is speaking on Sunday morning though, so that might be a better choice from an Atari perspective. I plan on attending - looks like fun. So what days are other AtariAge members planning to attend? It would be cool to meet some other people in person. Maybe we could schedule an AA lunch? Amiga Bill and I will be there both days, but since we are exhibiting we cannot leave the booth for long stretches of time. But be sure to say hello! I know you like these @Fletch ! I immediately checked my calendar when I found out about this at VCF East.. It would be a fantastic year for my first VCF spotlighting my favourite computers, but found it unfortunately conflicts with a family event... ERGH! Then I received the announcement that this years VCFMW will be held September 14-15, and so far it looks possible, so it really would be great for a big Atari 8-Bit presence there too! I wonder what the chances are of Joe attending both... Hoping to make it to that! Any chance Joes presentation will be recorded / streamed for those of us stuck on the wrong side of an ocean? Wife and I will be at VCFMW again this year. I plan on having 5 running systems across 2 tables. Anxiously awaiting venue information so I can secure a spot. You should hook up at least two of those systems via MIDI and have MIDI-Maze loaded and running. Back in 2004 I attended NWCGE expo where Joe did a presentation entitled ""3 Generations of Game Machine Architecture", so maybe the planned presentation might be similar. I recently dug up and posted a video from my 2004-era digital camera of his presentation at that event. Very exciting! I plan to be there Saturday. I will be there this year again. Putting on another Atari display again. Looking forward to seeing more Atari people this year. 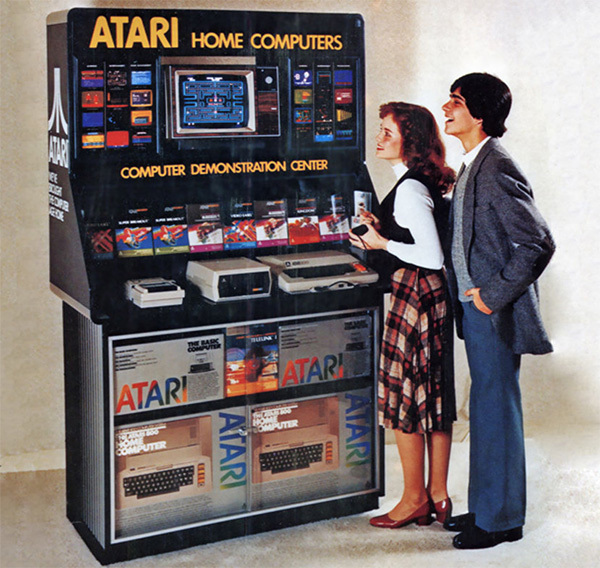 Hopefully Joe's talk and a big Atari display will bring more Atari people in. I will definitely be there this year. Looking forward to hearing Joe Decuir speak in person!! See you there.